An estimated 80-percent of college graduates leave school with an average credit card debt of about $3,000. U.S. 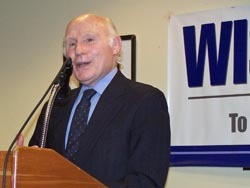 Senator Herb Kohl (D-WI) says much of that debt is the result of predatory lenders taking advantage of uniformed students. Kohl says credit companies have abused their powers in order to entice young people in to credit offers that are beyond their capacity to pay off. He points to interest rates that can quickly climb to as much as 30-percent and high credit limits that are completely unjustified. Kohl is a sponsor of legislation in the U.S. Senate that would impose new restrictions on cards issued to students. The bill would require companies to verify income, limit credit, and require an adult to co-sign if a student does not have a stable income. The measure would also prevent lenders from arbitrarily raising rates or imposing massive penalties for late payments that are just hours overdue. Kohl says he also wants to include a provision that would require students to receive a better education about how to avoid dangerous credit card arrangements. The legislation is expected to face a tough battle in Congress, after a Senate committee approved it last week on a party line vote.